Nosh or not is still there, we go off-topic and more in depth a few times, we try out a new mailbag segment, and then to tie it all together, we do our Not of the week. We've done this once before where we cover things that we would NOT nosh again. My pick is the treat you see below. They look cool enough right? And let's be honest, with this name, don't you just kind of assume that this is basically the raspberry version of a creamsicle? Well all I can say is boy I don't like these. The texture difference between the shell and the center is just way too whacky for my liking. This could have been fun but they ruined it with this icy, fracturing outside covering up a gummy inside. I didn't even finish the first bar I ate. On Second Scoop: Bleck, just bleck. Nothing is working for me here. 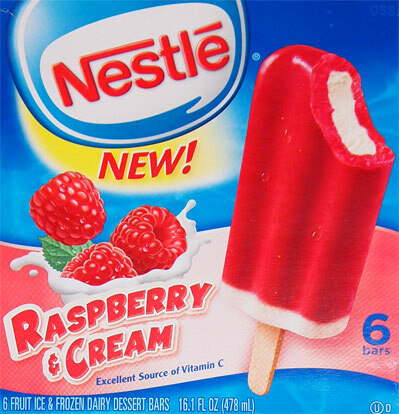 The raspberry flavoring is fairly mild, but the worst part is that it can't truly blend with the cream because of the texture difference. I decided to break the shell off my second bar and I think the shards in the background say it all. The "fun" part was that this allowed me to eat the cream center. 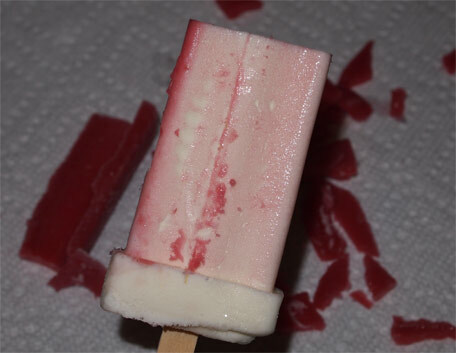 While at first it was vaguely amusing and reminiscent of a jell-o pudding pop, there is a weirdness to the cream that was steadily building up. Bleck. Number 2 is going in the trash as well. Boooooooooooooooooooo. 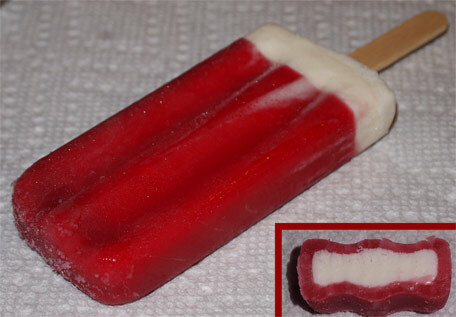 I wanted raspberry flavoring with creamsicle texture, not this junk. Dubba Daughter Note: as a lover of all things popsicle, she says.... she likes them! At least the box won't go to waste now. I knew I was being too picky... oh well, I don't have to like everything!